The staff has hijacked the blog — this one goes out to Stewf, our relentless purveyor of type news and commentary long and short. (Mostly short these days, so this post is also a reminder what a great platform this site still is. Let’s meet here more often again.) Thank you for everything. All the best to you. And many more happy years in type! 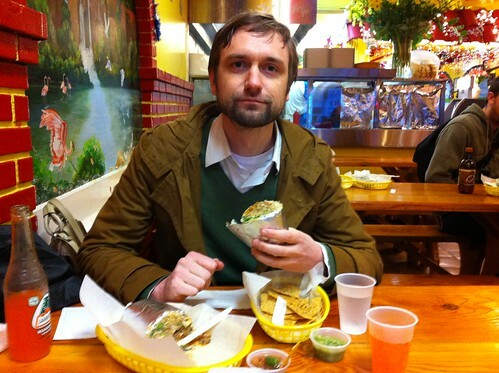 This photo by the way was taken on the event of my very first burrito. In the Mission, March 2011. But he still looks just as handsome. Happy birthday Stewf. Nice one Indra! HBD, Stewf! Horchata all ’round! Serendipitously, you share a birthday with my very first domain name, which just happens to be turning 18 years old today. And “frankly” … you’re in much better working condition than my site. Why not celebrate by having a sausage this big to go with that burrito. Thanks, pals! A very kind gesture, and a welcome nudge to post more often. I’ll close the comments now to prevent further cranial enlargement.